Koufonisi or Lefki is situated in the Libyan Sea, at the southeastern part of Crete, south of the prefecture of Lasithi, at a distance of 3,5 nautical miles south-southeast of Cape Goudoura, and 10 nautical miles southeast of Makrys Gialos. 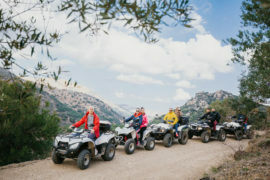 It is the biggest in a cluster of islets and skerries (Koufonisi, Makroulo, Stroggylo, Trachila, and Marmara), and has a distinct history and natural beauty. The island is about 6 kilometers long, 5.5 kilometers wide, and has an area of 4,26 square kilometers. 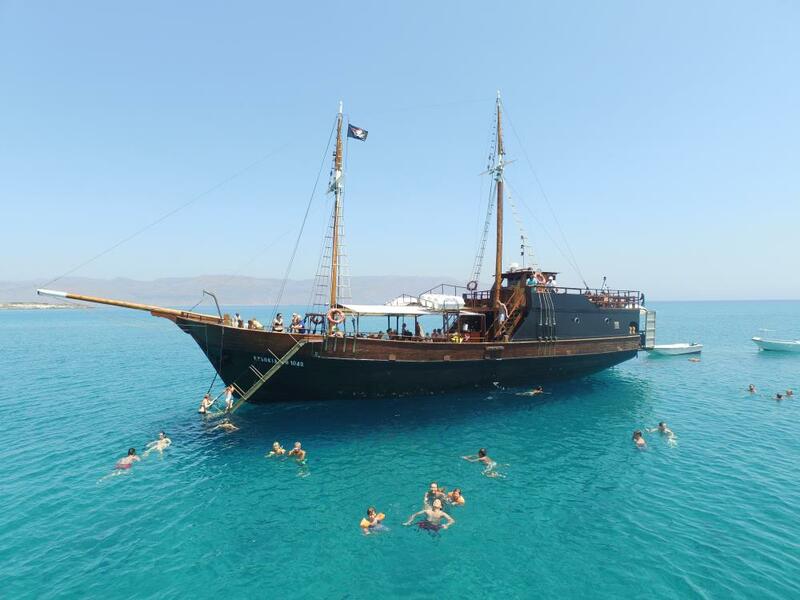 Evdokia, our pirate ship, is 26 meters long and has a capacity of 150 passengers. It departs from Makrys Gialos and heads to Koufonisi. With soft music playing in the background, we will be sailing in the turquoise blue waters of the Libyan Sea, and the ship will anchor off the coast, giving you the chance to swim in the crystal clear waters. On the ship’s open decks, your children will enjoy our special animation program and will have the chance to experience a magical pirate adventure, by participating in various games, such as a treasure hunt, water gun fights, face painting, and many more. As the ship approaches the island, you will have the chance to see the lovely beaches, the caves, and magical bays the seawater formed in its soft rock formations. 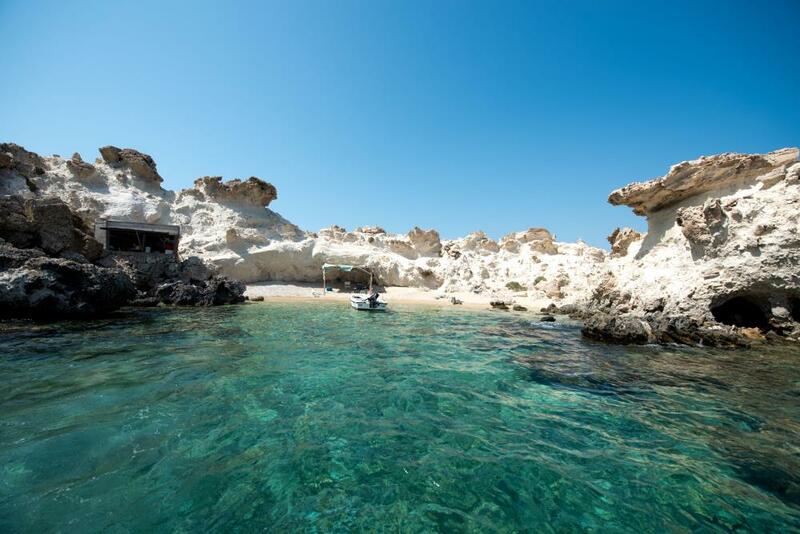 Koufonisi has 36 stunning beaches, with fine white sand, and emerald waters. Some of them, such as Asproulos, Hiliaderfia, Faros and Anemertia next to the Roman theater, could easily be among the best in Europe. Many years ago, a British yacht anchored in Hiliaderfia for a week, with Prince Charles and Princess Diana onboard. Our ship shall moor in a wind-protected beach, and you will disembark by boat. The island’s vegetation is low and bushy, almost Steppic, with rare -for Crete and Greece- species. 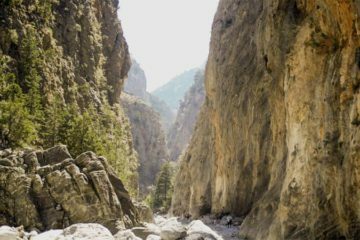 If you feel like hiking, bear in mind that not all areas are accessible, and you need to wear snickers, a hat and sunscreen. Koufonisi is a habitat for tens of migratory birds. Among the reproductive species, there is the common Gull, various waterfowl, and predators. Other animals include the Aegean lizard, which usually lays under the sun on white rocks. The island’s name “Koufonisi” (trans. : Hollow Island) derives from the caves and caverns formed by the seawater and the rain on its soft rock formations. 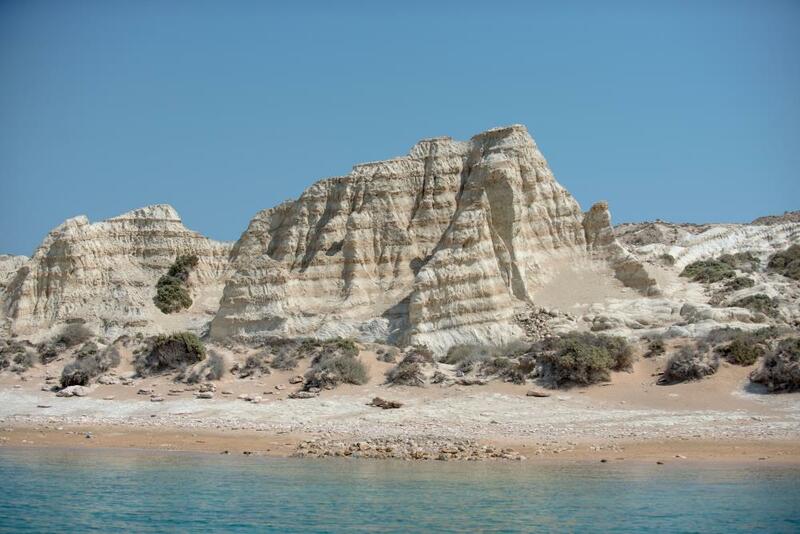 While you are there, you will have the chance to see the white rocks, against the backdrop of the Libyan Sea’s endless blue, enjoy the tranquility of nature, and swim in the crystal clear waters. 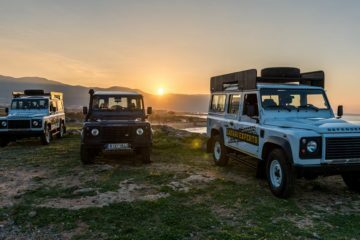 The landscape will dazzle you, changing from steep rocky shorelines, to caves with white and yellow rocks, and unearthly dunes. If you have time and energy to explore more paradise beaches and waters like that see all our Cruise tours on Crete. The island is uninhabited today but still filled with remnants of past human activity that starts from the Early Minoan times until the post-Byzantine era. The locals like to call Koufonisi as Delos of Crete, due to the significant archaeological monuments found there, including a stone theater, which is the southernmost ancient theater in Europe, with a capacity of 1,000 people, and a settlement, which was looted and destroyed in antiquity, where an impressive villa, with 8 still preserved rooms, and another house with 16 rooms were unearthed. However, the most important monument is the Roman public baths complex, which was used from the 1st until the 4th century AD and bore evidence of lavish decoration. The archaeological monuments are currently not visitable. 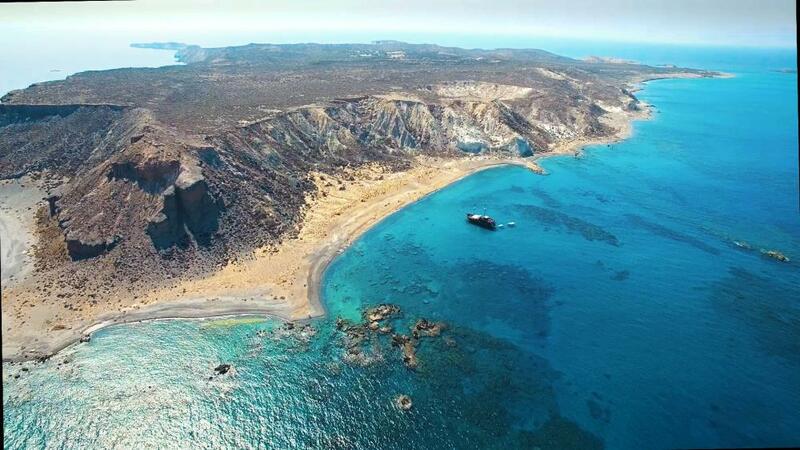 In antiquity, Koufonisi was an important hub for sponge fishing and porphyry -known gastropod- processing, where ancient Greeks and Byzantines were extracting the wildly popular purple color from. The island had strategic importance due to its position and was claimed by the inhabitants of Itanos and Ierapetra, only to be conquered by Itanos. In the southern part of the island, there is a temple unpreserved for thousands of years until 1920, which is when it was completely destroyed, to give its place to a brand new lighthouse. Large pieces from the devotional statue and many smaller ones from the temple were used in the creation of the lighthouse. In the early Byzantine times, the island was used by monks, who engraved figures of saints and inscriptions in Latin on the walls of caves found on the west coast. Finally, the scenic chapel of Agios Nikolaos, patron of seamen, is located on the north of the island. Today, the island is a haven for fishermen, away from the strong winds and rough seas of the Libyan Sea. In recent years, the wealth of its history and environment were discovered and studied. This knowledge and the natural beauty of the island are a gift to visitors who must respect and protect it. You may return to the ship at any time, but make sure you are back at least 10 minutes before departure.